Marcy 100Lb. Stack Home Gym with Pulley, Press Arm, and Leg Developer MKM-81030 by Marcy at Strongman Pictures. MPN: MKM-81030. Hurry! Limited time offer. Offer valid only while supplies last. Engage in fat-burning training without leaving the comforts of your home and no club membership fees by using the Stack Home Gym Station from Marcy! Engage in fat-burning training without leaving the comforts of your home and no club membership fees by using the Stack Home Gym Station from Marcy! Created to combine superior functionality and the utmost convenience, this fitness gear features an ergonomic structure that includes arm and leg stations to let you efficiently perform a full-body workout at home. This home gym system is made of a heavy-duty steel tube frame. With its powder-coated finish, the steelwork effectively resists damage from intense use, guaranteeing you an investment that is built to last! This home gym machine is equipped with dual function press arms that are great for executing upper-body exercises such as chest and pec fly pressing, while the bar is perfect for performing pulldown exercises, developing both the chest and the back while building shoulder strength. For dedicated bicep workouts using dumbbells or weights, the adjustable preacher curl bicep pad keeps you in a proper position without adding strain to your body. You won’t have any excuse for missing out on leg day as this home gym system also showcases a leg workout station allowing you to add some lower body workout. The leg developer is designed with a pivot point to align knee joints and help keep them in a proper position, avoiding incorrect body form that may lead to injury. This system measures 56.5”(L) x 34”(W) x 79.5”(H). The package includes all necessary hardware along with instructions for hassle-free assembly. Achieve a stronger and healthier body with the Marcy Stack Home Gym Station! COMFORTABLE PADDED SEATS - The Home Gym Station features ergonomically designed seats that are built with high-density boxed upholstery to reduce tension and impact while also facilitating a proper sitting position when performing exercises. 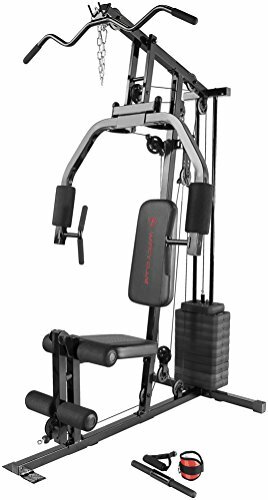 CONVENIENT HOME GYM - Features an innovative structure that combines arms and legs, great for strengthening different muscle groups and executing comprehensive full-body workouts. There's no need to leave your house to train for the body that you want! MULTIFUNCTIONAL PRESS ARMS -Designed with dual action press arms, this versatile equipment will take your fitness game to the next level by allowing you to perform a variety of arm and chest exercises to develop your biceps, triceps, pectorals, and more! ADJUSTABLE WEIGHT STACK-Comes with 100lb of selectorized weight stack that can be customized according to preferences. The stacks are coated with vinyl for enhanced durability and include a safety lock that prevents unauthorized usage of the equipment.